When it is cold outside, the middle of winter, and you don’t feel like going out… it is the perfect excuse to stay home and craft! (but let’s be honest who really needs an excuse?!) We have provided some free winter SVG files that will get you feeling all cozy and snug. There really is something magical about winter… at least that’s what people who love winter tell me. If you are more like me and aren’t as big of a fan of cold weather, then these free SVG files over on this post might be more up your alley. Either way, winter lover or not, we have got you covered. PLEASE NOTE THAT SOME LINKS ON THIS POST ARE AFFILIATE LINKS. THIS BASICALLY MEANS AT NO EXTRA COST TO YOU WE EARN A SMALL PERCENTAGE WHEN YOU SHOP THROUGH THEM. All of our files on the site are available for personal or commercial use up to 200 uses. The items must be made in house by you. (this means no outsourcing like Amazon Merch or Printful) We also don’t allow any part of our designs to be re-sold or re-distributed. If you know that someone will love this file please give them the link to download for themselves instead of sending them the file. Thanks! The saying on this design just flows right off the tongue. It is perfect for all ages and I can see it being adorable in some printed HTV like this. It would look great with everything one color (like pictured below) or even if you broke up the colors a little bit. Check out this post where we explain exactly how to apply Heat Transfer Vinyl to shirts. Also make sure to check out the secret to get your design 100% center every single time here. Or if you have enough shirts then think about putting it on a blanket as snugly decor by your fire. When I think of snow days these were the first three things that popped in my brain. (PJ’s and sleep also popped in there but I’m not sure that went as well with the design flow) Hehehehe Grab a mug like the one pictured here. Also over on this post we share all of our favorite items off of Amazon to use for crafting blanks. Make sure if you do create something like a mug, use adhesive vinyl and transfer tape. We explain all the various vinyl types here and all the different types of transfer tape here. This design does double duty in my mind. Even though I’m not a big fan of the cold, I can’t deny the beauty of the freshly fallen snow. I love how kindness can warm your soul as much as a beautiful view can. This design on a little frame like pictured below or on a reverse canvas with some glitter HTV would look cute on a mantle for simple decor. I can even picture it in a classroom during the winter. It would serve as a gentle reminder to the students who look at it daily. Check out more teacher gift ideas here. The project pictured below would be the perfect tote to carry around during the winter. You can grab the totes super cheap at Hobby Lobby or snag a set of 3 from Amazon here. I envision this design with the words ICICLE in a holographic vinyl. It would really make it come to life. Someone needs to make sure and create this design with this brick HTV. I can see the words HEAVEN and the snowflakes now being a little bit raised with the brick which would add even more emphasis on them. This would look great on a sweatshirt or painted on a wooden sign. Oramask is my go to stencil material for signs. 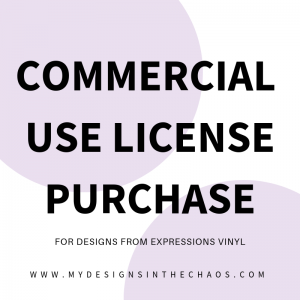 Check out our favorite tips here on how to have almost no vinyl waste when creating your projects. We would greatly appreciate if you took a moment before downloading the files below and pinned an image or two above! It helps us to continue to provide freebies and create content you love! Which design is your favorite? We know that you will find one that you love! 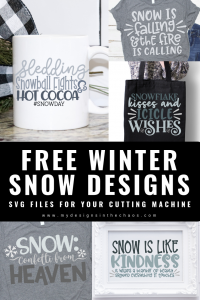 If you love winter files make sure to browse more winter designs here and shop all of our favorite crafting supplies here. While we don’t currently accept custom design requests we always love suggestions of themes, questions, or projects that you would like to see on our site. Happy Crafting, Cutting, and Chaos! I get so excited with every freebie, I love your style so the designs are just what I would create myself if I were a tad more creative!!! Thanks!!!! My favorite is #snowday, even though we don’t get many snow days in South Texas! I love all of your designs! What font did you use in the “snow confetti from heaven” file?